Overview: Moonlight Mystery is a 5-reel 15-line video slot machine. Similar to the famous board game cluedo, Moonlight Mystery is a "Who Dunn-It?" murder mystery featuring a full cast of characters with dark secrets. Help the Inspector solve a murder, which takes place in an old mansion on a dark and stormy night, and win big by choosing the crime scene, method, culprit and motive of the murder in the "Who Dunn-It?" Moonlight Mystery bonus round. Moonlight Mystery video slot machine offers some new and special features never seen before. These include "Poison Bottle" icons, which are wild, and expand during free spins. During normal play, wins are multiplied by the number of wilds in the win. During free spins 1 wild is 2X, 2 wilds is 3X and 3 wilds is a huge 4X multiplier. 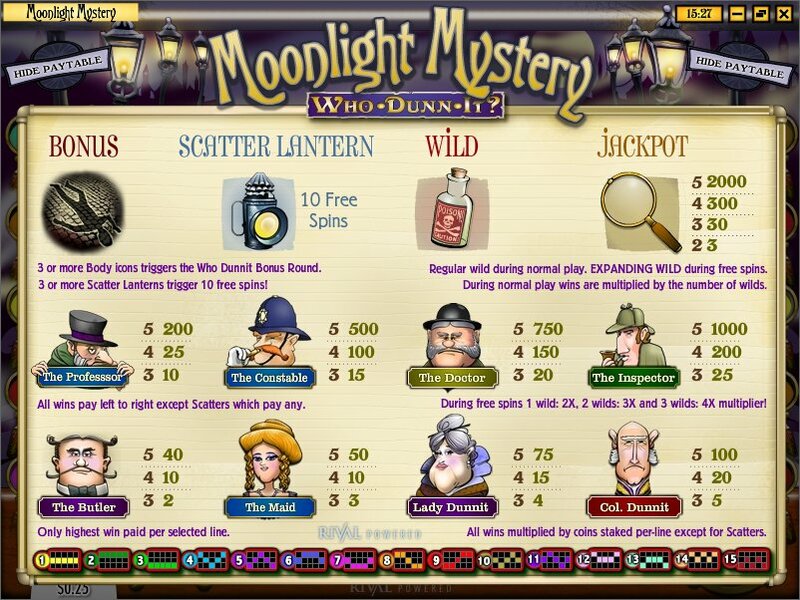 Moonlight Mystery's second special feature includes the "Scatter Lantern" icons. Get three or more of these icons and trigger 10 free spins. The final special feature of Moonlight Mystery is when you hit the Chalk Outline icon. This will trigger the "Who Dunn-It?" bonus round and gives you the opportunity of winning big. 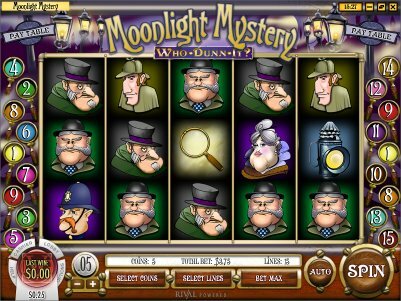 Similar Slots: If you like Moonlight Mystery, you might like these other Rival video slot machines: Doo-Wop Daddy-O, Flying Colors, Gobblers Gold, Roll out the Barrels, Secret Garden, Whale O' Winnings.